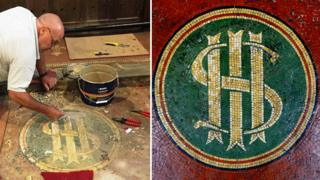 Intricate Victorian mosaic floor tiles have been uncovered during £190,000 renovation work at a Flintshire church. Contractors restored the tiles at St Michael's Church, Caerwys, after many became dislodged when a 40-year-old carpet was lifted near the alter. About 50 regular parishioners raised £35,000 towards the refurbishment costs, including replacing a portable toilet in the churchyard. The tiling, showing a Christogram, is believed to date to a revamp in 1896. Bishop of St Asaph, Gregory Cameron, is due to rededicate the church during a service on Sunday. Grants also came from half a dozen sources including the Diocese of St Asaph, the Heritage Lottery Fund, and the National Churches Trust.